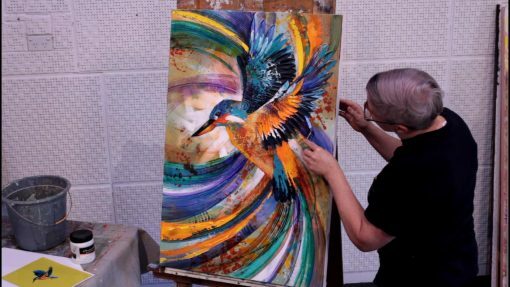 Follow and copy the exuberant Australian artist De Gillett as she leads you through every step of making a textured, layered, gloriously colourful acrylic painting of an Azure Kingfisher in Flight in this unlimited access workshop complete with printable resources. 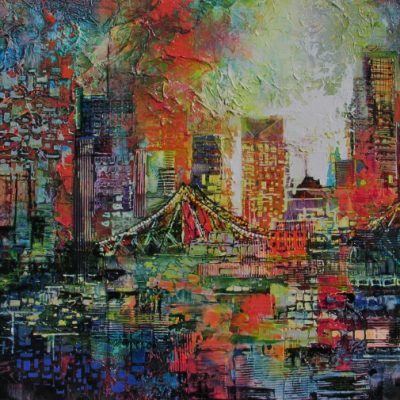 Acrylics Texture, Spatter & Glazing Class – unlimited access to our 2 hours+ online acrylic painting class in building vibrant, colourful paintings. 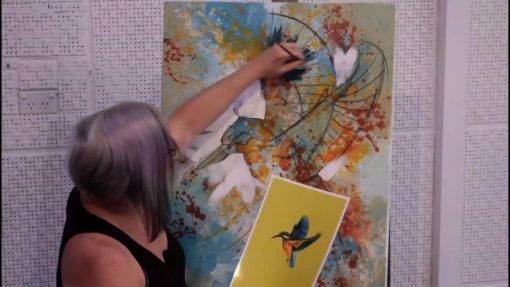 Follow Arts Tree‘s experienced, exuberant, award winning lead tutor De Gillett in this online acrylic painting class as she leads you through every step of painting a textured, layered, gloriously colourful acrylic painting of an Azure Kingfisher in Flight. What materials will you need? Find out here. Preview what’s in store with this clip of excerpts! 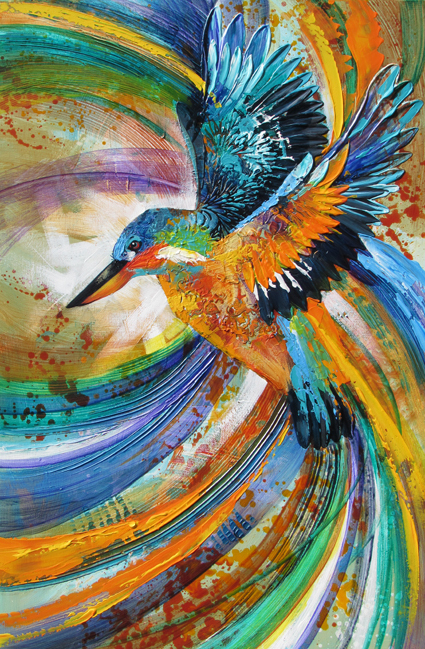 De Gillett is known for her signature style, all about colour and movement. Generous to a fault, she keeps no secrets and fully explains all the techniques she has developed through painting for the last 20 years. Using palette knives, combs, and fan brushes; binder medium, texture paste, and acrylic paint; in this online acrylic painting class De builds a painting from the ground up, ensuring that you are never left with the ago-old problem of having gaps on your canvas that you just don’t know how to complete. 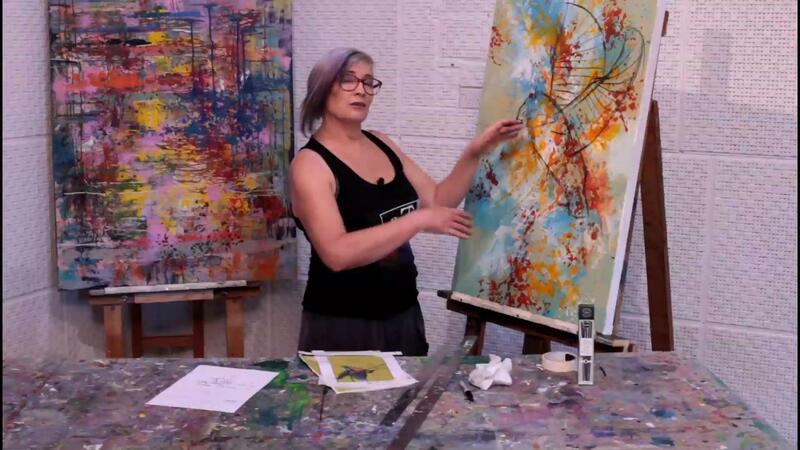 Over the years, she has found ways to loosen up her own style, and this is what she passes on to her many hundreds of students. 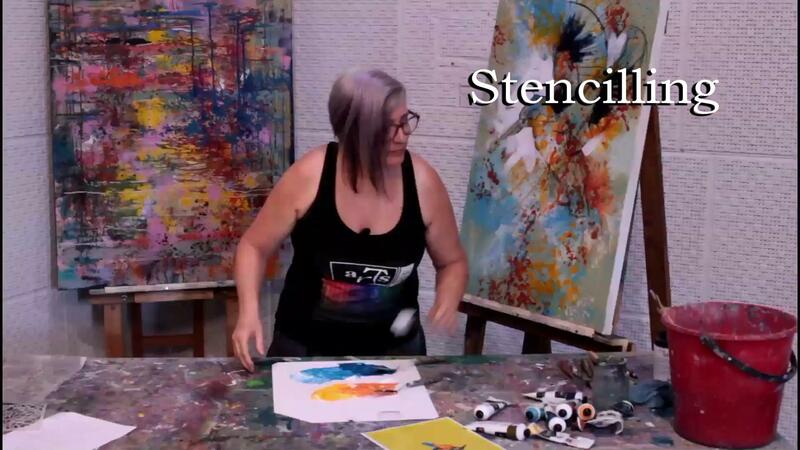 Watch and learn De’s unique self-developed techniques as you build your canvas through grounding, drawing, spatter, impasto textures, glazing and finally detail with every step demonstrated and fully explained. 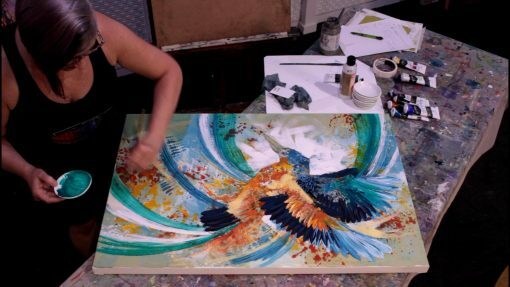 Replete with tips, close-ups and downloadable resource files this online acrylic painting course with De makes sure you gain the skills you need to make every future painting full of life and motion. Subscription gives you unlimited, permanent access with no expiry date- jump in to any chapter at any time and watch as many times as you like! I LOVED this course! Loved that I could go back again and again and re-learn. Have done a face to face class with De in the past, and found this online course to be filled with the same generous teaching, and wonderful enthusiasm. Only limitation is not having someone around to comment on what you have done – but it does address generic problem solving. Hi Rochy, it’s so wonderful to know that you are having fun with my techniques for painting! Happy studio days…!!! Here’s a review from Aisling, who couldn’t wait to tell us in person how much she enjoyed the workshop! Aisling said – “As a person who learns through doing rather than watching, I was doubtful that watching a workshop onscreen would be useful to me. Boy was I wrong! I was fascinated – sucked in straightaway and scribbling down notes like a madwoman. To see every single step from blank canvas to finished painting, and to be able to selectively go back through the chapters & see bits time and time again was fantastic. The drop-down titles really helped with learning the vocabulary of painting & the names of the products used. 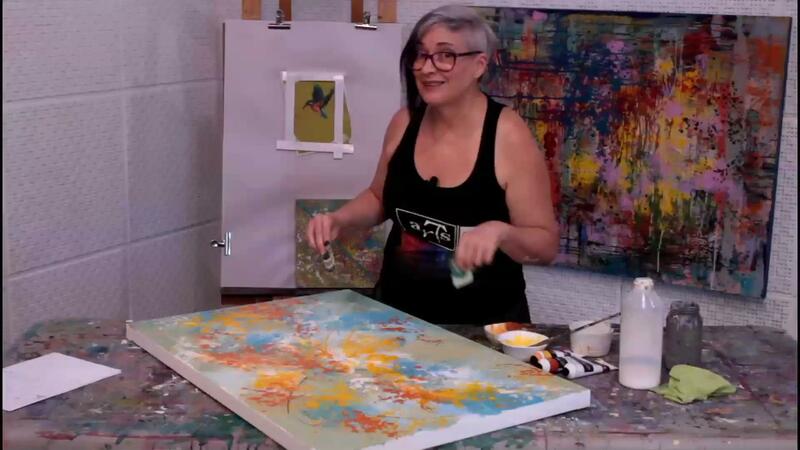 I have attended multiple workshops & classes with De, and truly thought I understood about glazing; but she managed to teach me even more during this video workshop. Now that I understand about different knives and brushes & how to use them, I have gifted myself some exciting new tools to use in my next paintings. I ordered this online course after going through the two inking courses and I loved it! Texturing & spattering is pure fun and can liven up any painting that needs a little extra oomph in order to come fully alive. What I love is the fact that anything can be used – as a mosaic artist, I’m well used to picking up anything that might be useful. This course is great for experimenting with all sorts of textures and like the other courses very liberating to the creative soul. So, thank you for all that you do and I’m looking very much forward to any future courses. WOW De another magic moment learning from you. 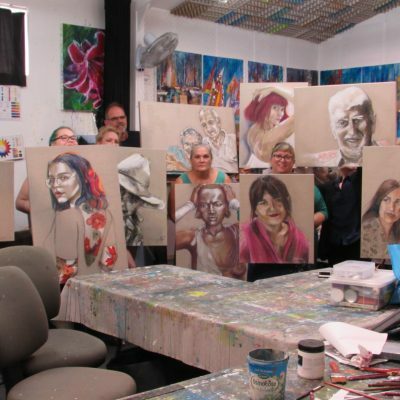 This online course was different for me as I have done a fabulous informative magic face to face 3 day Workshop with you in 2014 learning the inking process. The Spatter Glazing Course is another great way of using different textures and procedures that produces a great ending result. De shows in great detail every step on the way, you cannot get lost and I loved the end result. 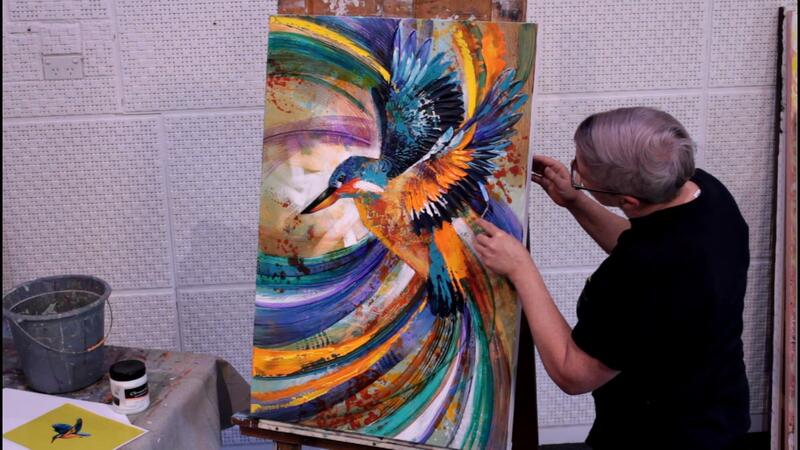 I have to add that my Kingfisher sold at it’s very first showing. Thanks so much De for your guidance and generosity. I really loved the course! So much is packed into it. Lots of detail on techniques delivered so enthusiastically. Looking forward to trying a drawing course. Thanks so much De and Graham. Brilliant! Very informative and easy to follow. I find the online courses I can keep going back and go over the information given which for me is very helpful than going over my notes. 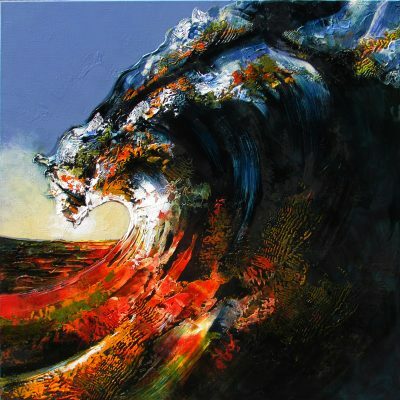 I loved De’s art and was rapt to find that she has online workshops available. De is a wonderfully generous and engaging teacher. 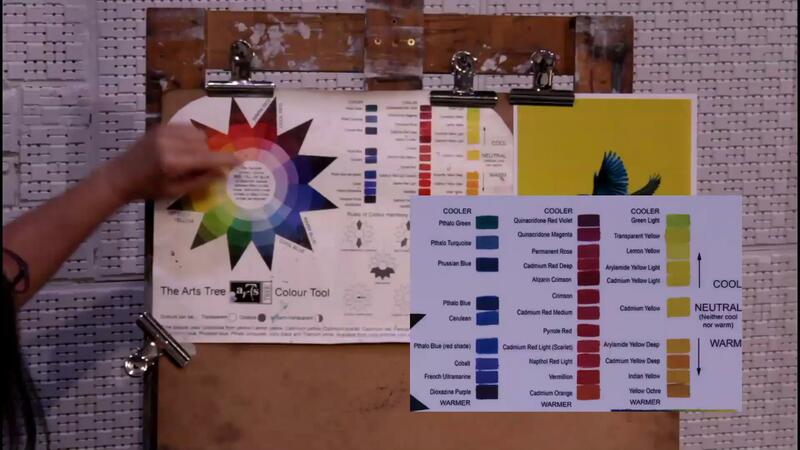 The online workshop is professionally made and produced and therefore super easy to follow. The sequencing and breakdown into separate subject/process segments makes the learning process much more relaxed and understandable. De carrys you along with her as she moves through the skills and processes and I never felt unsure on what to do. The online format makes it excellent value for money as I revisit parts of the course whenever I need to refresh my knowledge. 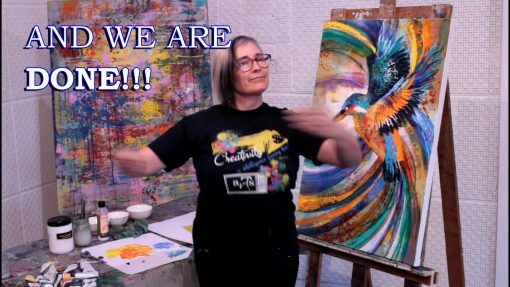 Over the last 6 years I have purchased many online workshops and lessons and Arts Tree are by are by far the best and most enjoyable. I have done a couple of these courses with De over the past couple of years and this online course has really captured all of the key features. Not least is De’s passion and enthusiasm so thanks De for the motivation and pleasure that you give. I absolutely love workshops with De. She is an amazing teacher and keeps no secrets. 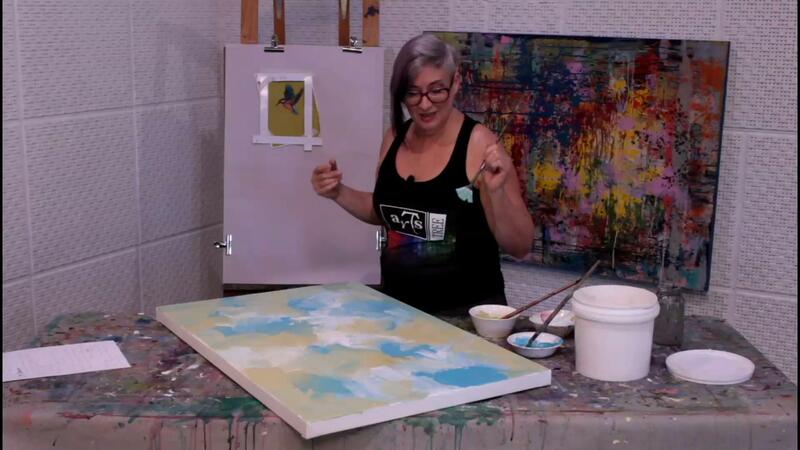 Her passion for life, art and unlocking the potential of her students is evident in everything she does. This video course is no exception. It’s incredible value for the wealth of information it contains. De steps students through a guided process and it’s great to be able to refer back to the techniques time and time again. Sure, you can make this wonderful painting, but why stop there. With the video lesson in your “paintbox” you can apply the techniques to your next exciting project. Loving your work De – can’t wait for the “Gesso Soup”.